Director, Tina Cafeo, should probably be put in charge of the Gulf oil spill after demonstrating her management skills here with a cast and crew that included more than 100 local people who had clearly worked very hard to produce a fun-filled show for the Montgomery County community. With its book by Thomas Meehan, the tuneful music of Charles Strouse, and the witty lyrics of Martin Charnin, this familiar story of Little Orphan Annie (and the search for her parents that takes her to the highest corridors of wealth and power in America), continues to delight audiences since its Broadway opening in 1977. Making Cafeo’s effort even more challenging was the use of alternate casts (A & B) for several of the lead roles. 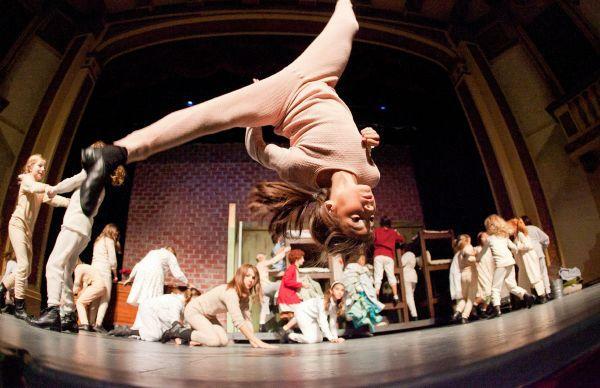 This allowed even more community participation for eager youngsters who always turn out for a chance to perform in “Annie.” The performance I attended featured the Cast B line-up. As the house lights dimmed, the sprightly orchestra (musical director, Ana Guirola) struck up the cheerful Overture and I heard a woman seated near me whisper, “This is such a beautiful theater.” Then it was off to the orphanage (set designer, Greg Kelly) where we first encounter the large cast of area youngsters that would display their boundless enthusiasm for the next two hours. Actually, they sang a bit too fiercely, as I suspect the director had over-cautioned them to make it LOUD, and had them stamping their feet much of the time. All of that tended to overwhelm the inherently sweet sounds of children’s voices and the pleasant music and lyrics here, which really speak quite well for themselves without extensive shenanigans. Happily there would be numerous other songs treated much more gently, although a couple of numbers suffered from microphone failures that were very distracting. A fine supporting cast includes talented baritone, Harold E. Wood Jr., as the millionaire, Daddy Warbucks, who offers a $50,000 reward for the location of Annie’s real parents. Statuesque Julia Stinson plays Warbucks’ sweet secretary, Grace, and Tommy Hunter plays Hannigan’s conniving brother, Rooster, who conspires with his girlfriend, Lily (Maredith Zaritski) to capture the reward by pretending to be Annie’s parents. Cameron Collier cheerfully lights up Act II as Bert Healy, host of radio’s “Hour of Smiles,” and sings a delightful “Your Never Fully Dressed Without a Smile,” with the singing Boylan Sisters (Jillian Nolan, Jenny Hoofnagle, and Kylee Michele Huddleston). Mackenzie Goode is a comic howl as the puppet, Wacky. Philippe Clarke warmly plays President Franklin D. Roosevelt, and there is plenty of cute political humor to add to the fun. While the printed program sadly omitted the shows song list, catchy tunes like “Easy Street,” and “N.Y.C.” abound. A fine adult chorus played both impoverished, Depression-era Hooverville residents (for the song “We’d Like to Thank You” that seems oddly contemporary in view of current economic conditions), and servants in the Warbucks’ mansion for wonderful tunes like, “I Think I’m Gonna Like It Here.” Robin Galley’s choreography nicely compliments many of the numbers. Of course all ends well in the opulent holiday scene at the mansion, with more eye-popping Christmas-red costumes from Zaritski than we could find at the end of the popular film, “White Christmas.” As the full cast sang the finale of “New Deal For Christmas,” faces in the audience lit up with smiles — even those who were not parents or grandparents of the many youngsters on the stage. One sad note: The sweet dog that played the role of Sandy was not credited in the program. I hope her union is looking into it. Researching the matter at Stage Right’s website, I learned the dog is a Labrador Airedale mix named, “Ginger” who has been adopted by the Hope Harris family. 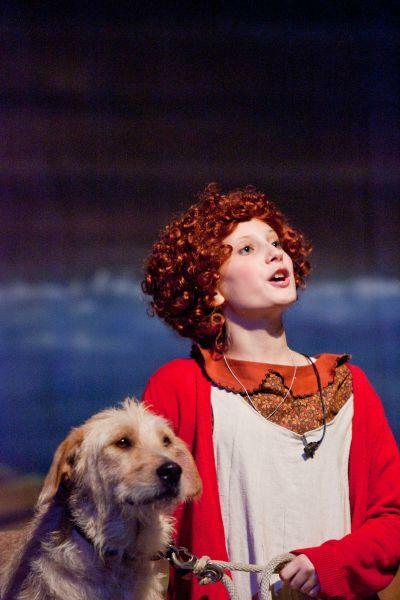 “Annie” continues at Conroe’s Crighton Theatre through Aug. 8 with performances on Fridays and Saturdays at 8 p.m. and Sunday matinees at 2 p.m. For tickets and information visit the website at www.stage-right.org, or phone the box office at (936) 441-7469 ext. 201.